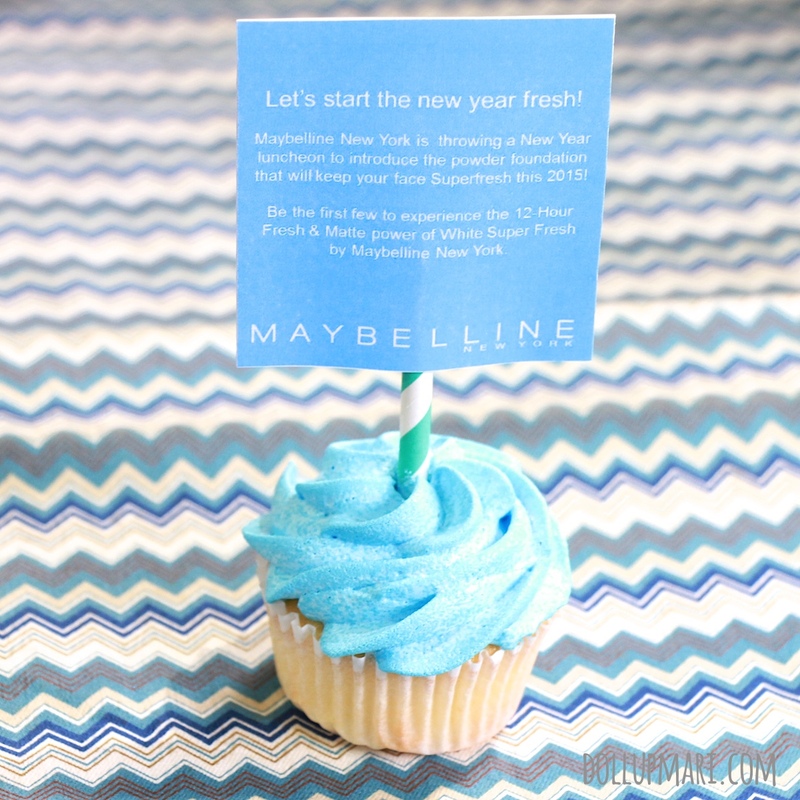 The invitation game is now over because I think Maybelline just won bloggers and press people over by sending over these cute cupcake invitations for their event held last January 22. I mean, while I am already fine with e-mail invites and text correspondences, the cupcake invitation just took things to a new level. 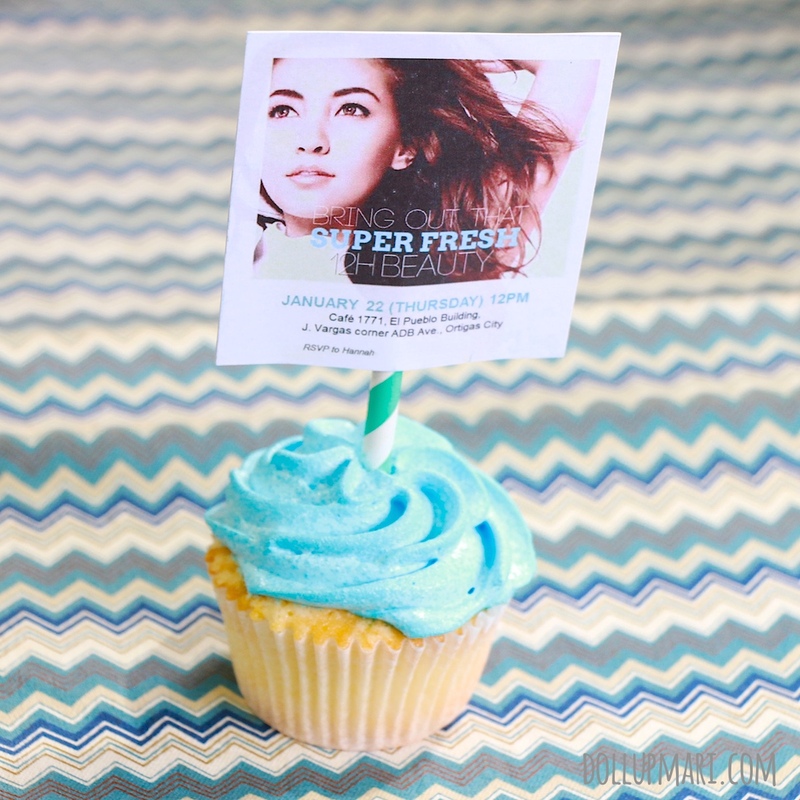 Aside from being informative and novel, this was a good butter cupcake, too, I must say. Hahaha. But well, I won't really dwell on this cupcake for this blog post because I'm going to talk about Maybelline's newest White Superfresh Powder Foundation! This isn't my formal review yet, so watch out for that, but basically this is my way of introducing the product to you guys. So well, the funny thing is, I never made it to the event. I had other business in the L'Oreal office to attend to, and since all the people from Maybelline were in Cafe 1771 (and there was no one in the office I could talk to while I was there), I thought I'd just catch up after getting my business done. But well, unexpectedly, I ran into the whole team at the elevator! I was already about to step out of the elevator to go to Cafe 1771 only to see them clad in blue dresses, with Cafe 1771 bags in tow, ready to enter the lifts. I ended up joining them on the ride back up, and the very beautiful Ms. Joan Hwang (their Junior Product Manager -- witweww!) was gracious enough to spend time explaining the features of this new product to me as well as giving me school advice (we come from the same course in the same school, so yeah). 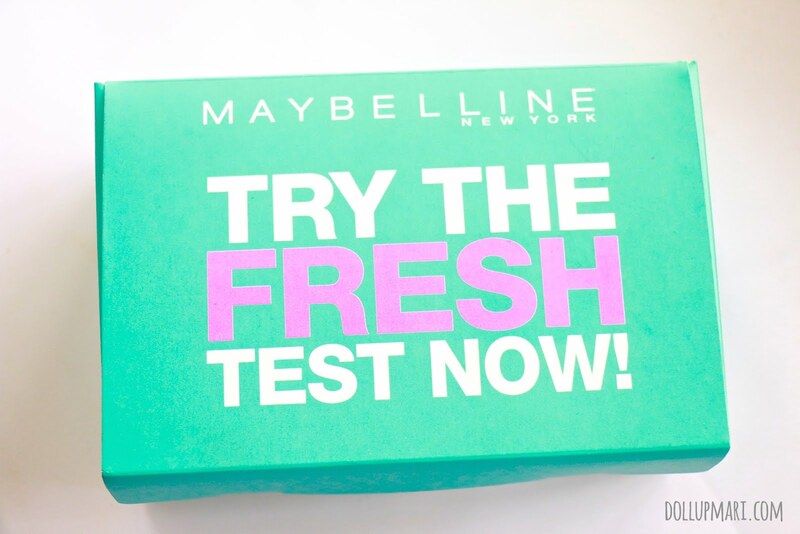 While everyone else in the beauty world was busy creating novelty products and all sorts of new sponges and whatever, Maybelline was busy solving some of the longest standing problems of women-- uncontrollably oily skin, and powders that cake and cake retouch after retouch. This is their first launch for the year, and the folks at Maybelline Philippines are ecstatic because the Philippines will be one of the first countries to try this product (normally launches aren't done here, but for this product, it is done here)! 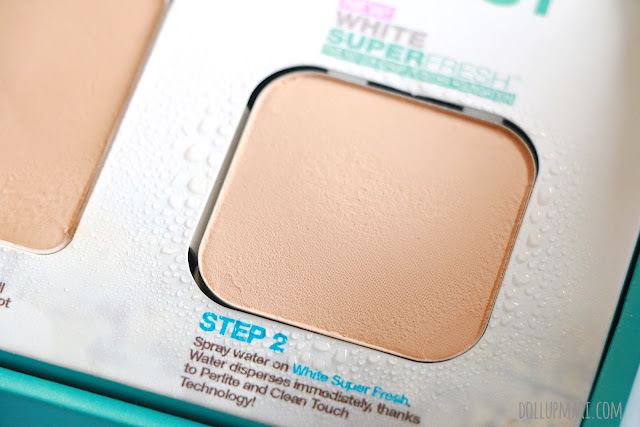 This new powder has what they call Mineral Perlite and Clean Touch technology. Clean Touch technology is how the powders do not let oil and sweat break it, but instead the powder absorbs it so that it doesn't feel heavy on your face. Instead of feeling murky and dirty at the end of the day, you can still feel fresh after it. I did ask Ms. Joan if this is also related to a new antibacterial ingredient whatsoever, and a rough summary of her answer is that directly, no. But indirectly, since you retouch less and therefore touch your face less and therefore transfer less bacteria to your face, 'Clean Touch' also refers to being less germ-ey here. To show what they mean about the powders absorbing oil and water, they gave out these Fresh Test kits together with spray bottles filled with water. 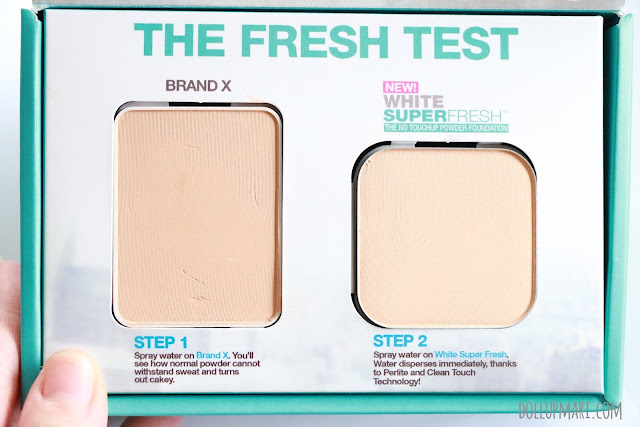 On the left is a generic Brand X powder (although I was able to guess more or less what brand this is I just won't tell you guys HAHAHA), and on the right is Maybelline's new powder. 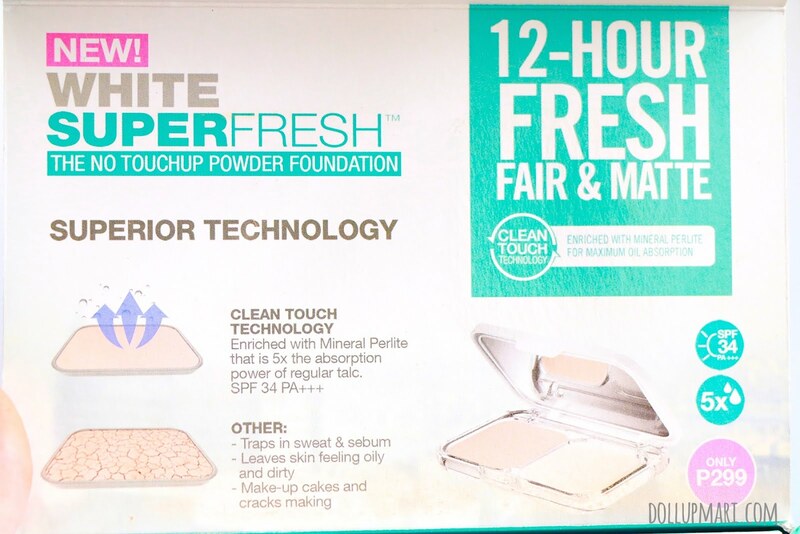 This powder boasts that it's got Mineral Perlite for maximum oil absorption, and I also think a light colored face all day (not as in look like a geisha but rather some powders oxidize and darken up when on the skin after X number of hours). What happens with Brand X is that when you spray water on it, it just floats on the surface and floods up the area, as seen here. 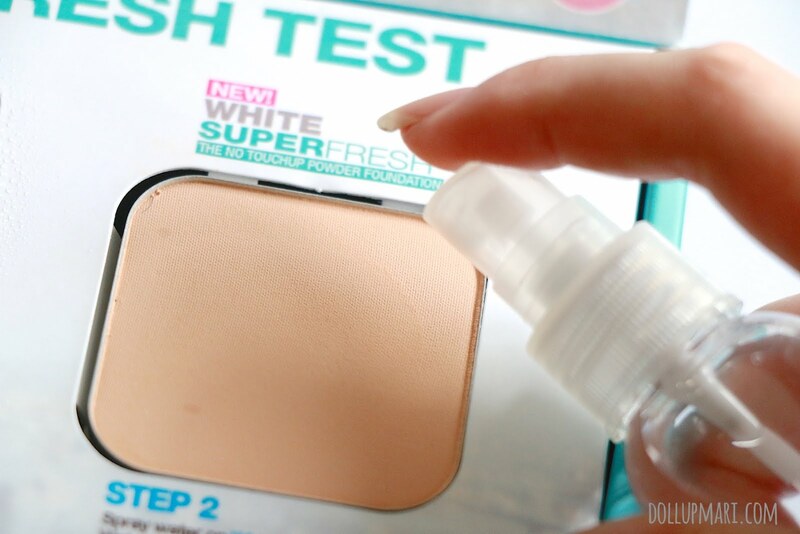 But with Maybelline White Superfresh, the moment you spray water on it, the powder absorbs it before your eyes. To be honest, I even had to plan my shots and increase shutter speed just to be able to get these shots as the water disappears soooo fast! So this is me right before spraying the powder with water. 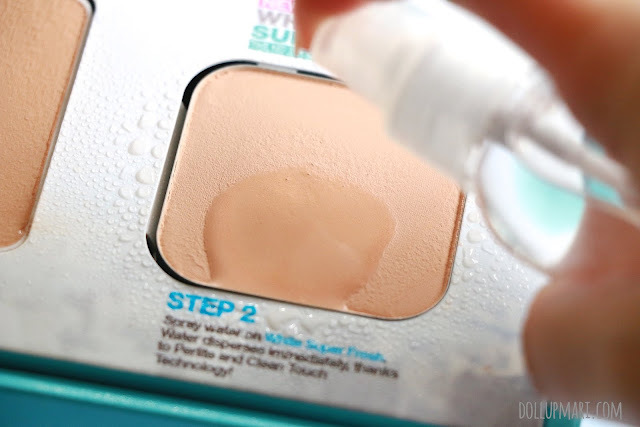 The moment the water comes out of the spray nozzle and reaches the surface of the powder, the powder already starts to absorb it. After about half a second most of the water is already absorbed. And about two seconds later the pan looks like it was never wet in the first place. To show the limits of the product. I abused the two powders and sprayed about thirty sprays of water to each side. 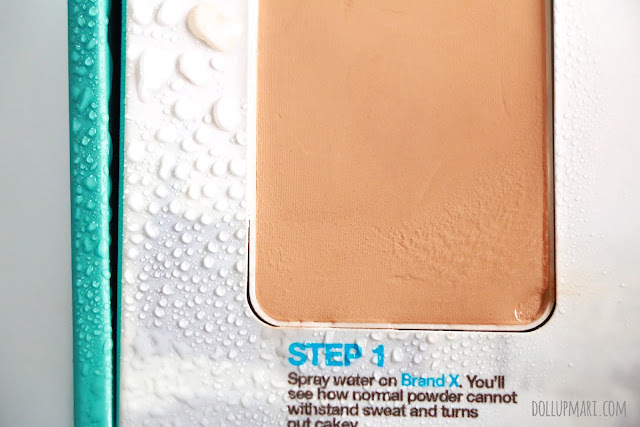 Since Brand X was already flooded on the surface, I just wiped the water off with tissue. 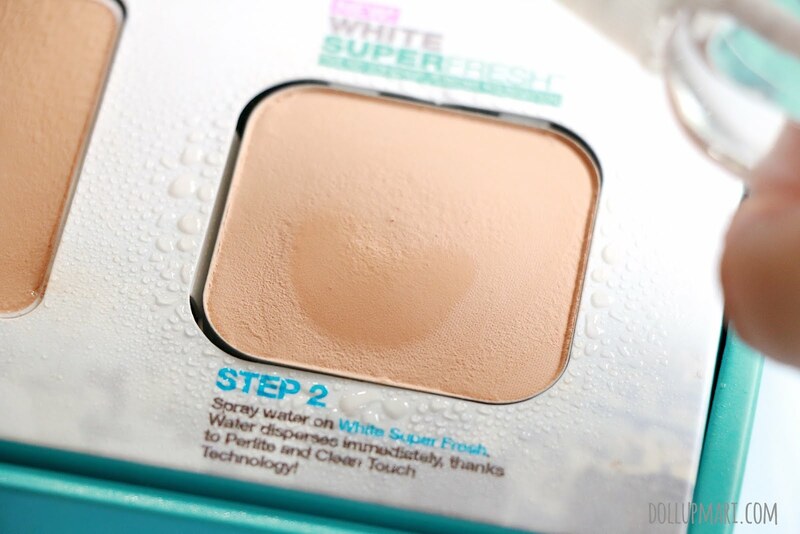 But from this view, you can see that the Maybelline powder is already bulging because of all the water it absorbed. When I put this in front of an electric fan, it actually cracked afterwards because after the water was dried by the electric fan, there was a hollow area in the bulge on the powder. It really proved to me that all the water went into the powder and not into some magical repository. 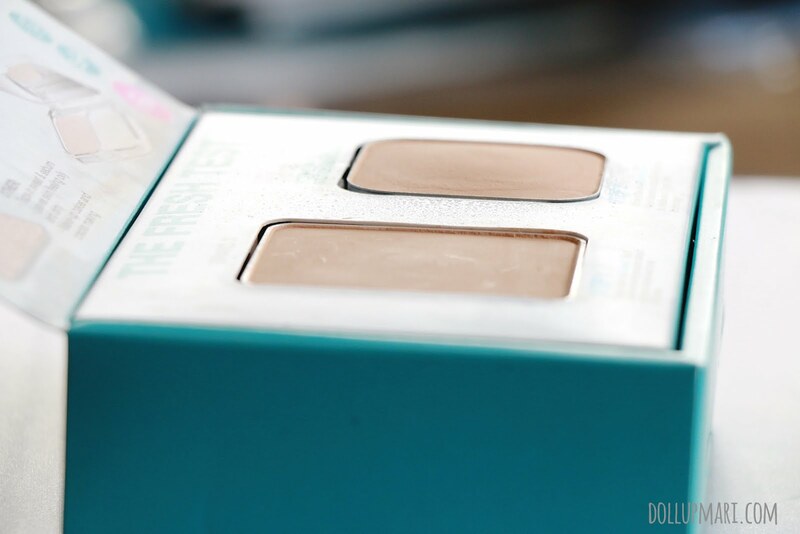 (dear makeup lovers do not cry because aside from Maybelline giving me another powder in the proper casing, I will not stop loving this broken one). Definitely, this is a very promising product which I think will break the internet this 2015, especially inside Pinay beauty junkie circles. 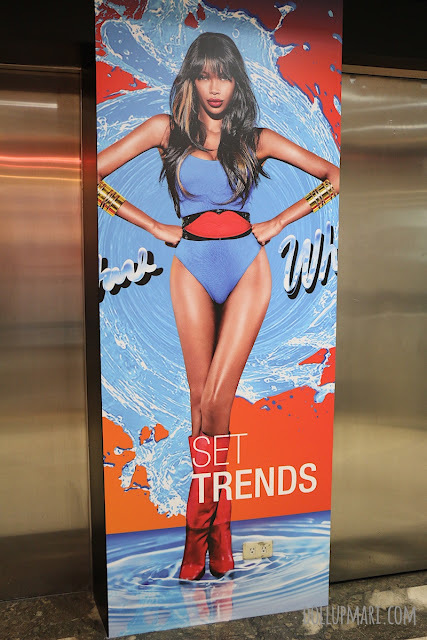 Since I didn't make it to Cafe 1771, I took photos of the lovely Maybelline posters at the office instead. 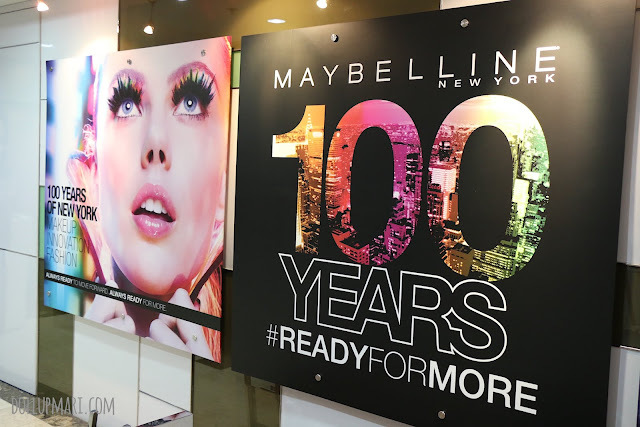 I have no idea when they are celebrating 100 years exactly, but still, congratulations, Maybelline! (but meh I'm still sad I was not able to make it I heard that the bloggers were treated to hairstyling, makeup, truckloads of cupcakes, good food, and other fun stuff). I hope I can make it to their consumer event which I was told will be sometime soon this quarter. So yeah, get excited dear people because it's time to get #Superfresh! Oh this product already release since last year in my country. So far this product is the best I ever tried to hold oil on my nose area. Interesting to hear that! What country are you from by the way?